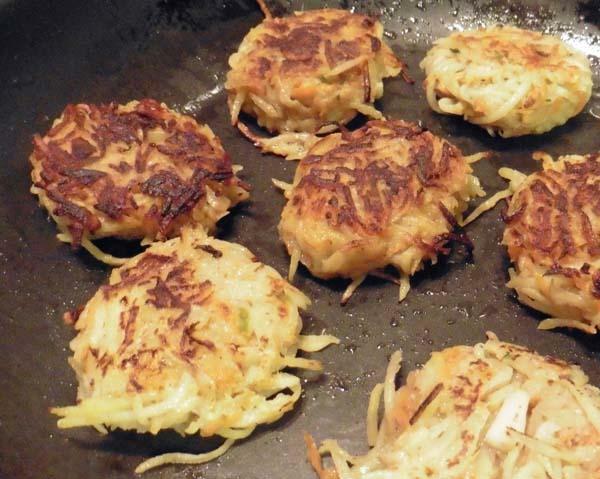 Generally, Alu Tikkies or potato cutlets are made with boiled and then mashed potatoes. 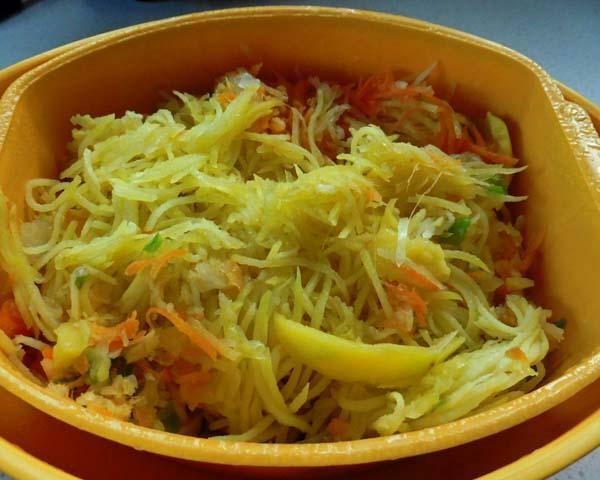 One day, I decided to make them with grated potatoes. As I had a few carrots around, I added them too. 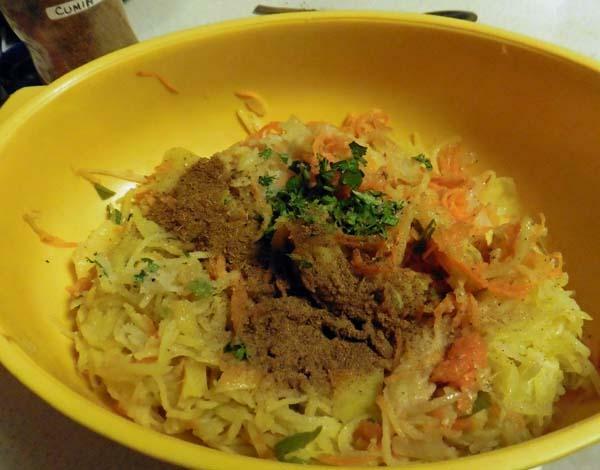 The result was great, a tasty, filling, textured potato chop. To give them a little bit of ‘binding’ character, I steamed them in a microwave oven first. 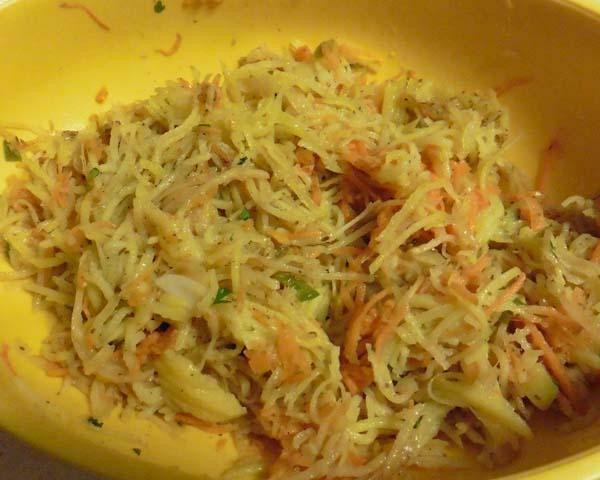 To add to the flavour, I added grated carrots too. The result was a crispy, textured and tastier Alu Tikkies than made in the traditional way, with mashed potatoes. All potato varieties do not have enough of ‘binding’ property, so if you have difficulty in shaping them, feel free to add a little arrowroot flour/ besan/Bengal gram -chickpea flour or 1 egg. 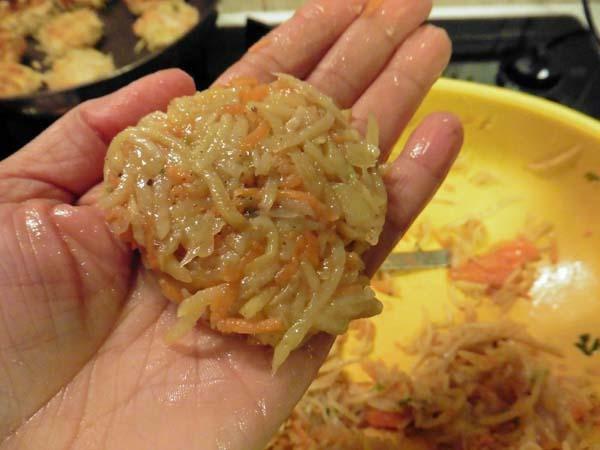 Makes 12 medium sized tikki. 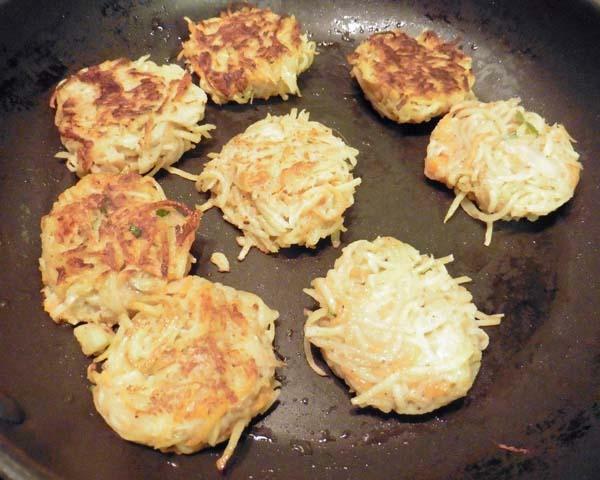 See several other Potato Tikki recipies on this site. Imli (Tamarind) Chutney and Green Coriander and Mint Chutney to serve. 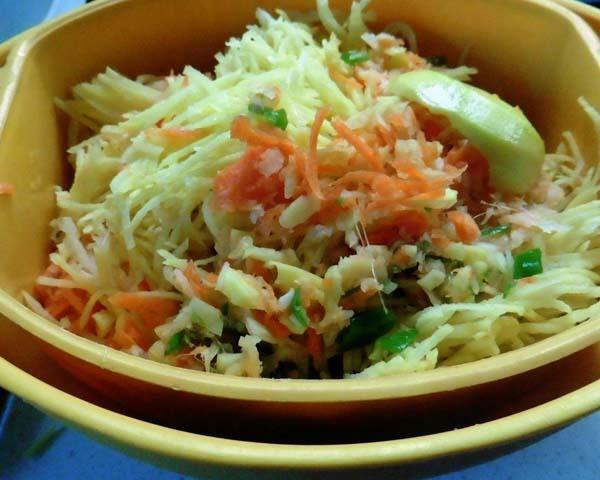 Wash, peel and grate potatoes, carrots on a fine grater. 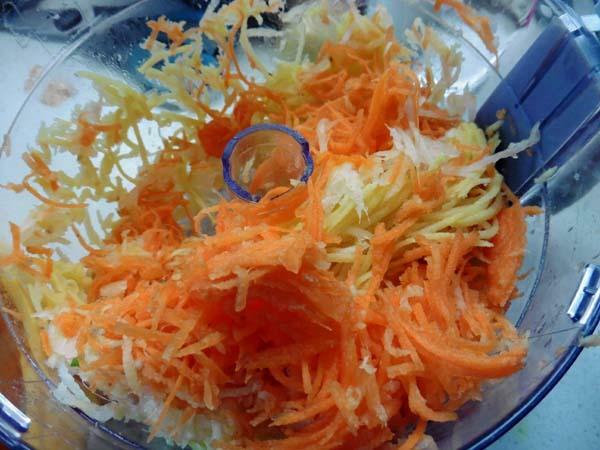 I do this in my food processor. Steam in a microwave steamer, on full power, for 4 minutes. Meanwhile, chop onion, ginger, green chilli and coriander leaves finely. Allow to cool a little. 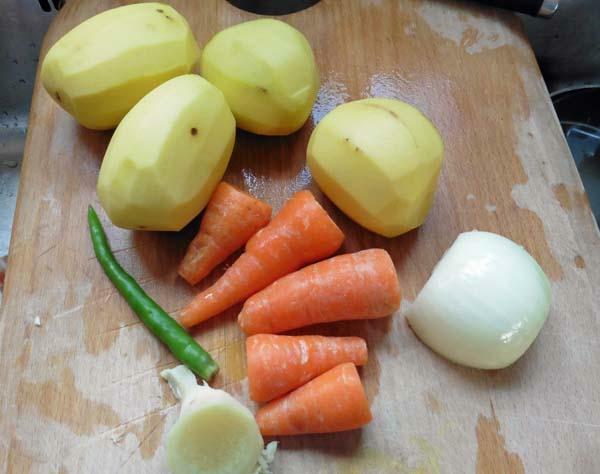 Place steamed vegetables, and rest of the ingredients in a bowl and mix gently, without mashing the potatoes. Otherwise, you will loose the texture. 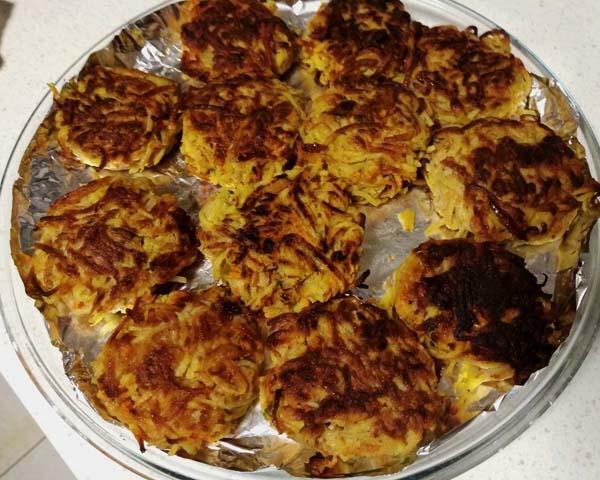 Try to make one ‘teser’ tikki/cutlet. If it doesn’t bind easily, add a tablespoon of the flours mentioned above or one beaten egg. 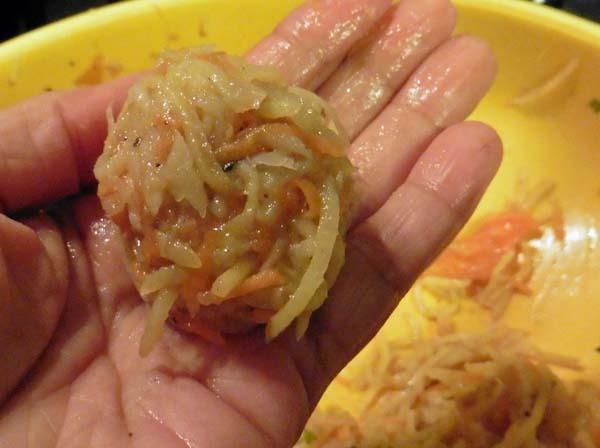 Make small balls of about 1 tablespoon of the mix and then flattening it to a burger shape (pictures 8 and 9). Heat oil in a pan. I use a heavy bottomed pan, you can use a cast iron Tava /griddle instead. Gently place the tikkies in the pan and cook on low-medium heat, turning over a few times, until golden brown and crisp on both sides. Use a thin spatula to turn them over carefully and gently. Serve hot with the chutneys of choice. You can serve a small bowl of lightly beaten and seasoned yoghurt on the side, for people to add some of that too, if they like. Tikkies are often served with a dollop of yoghurt in India.